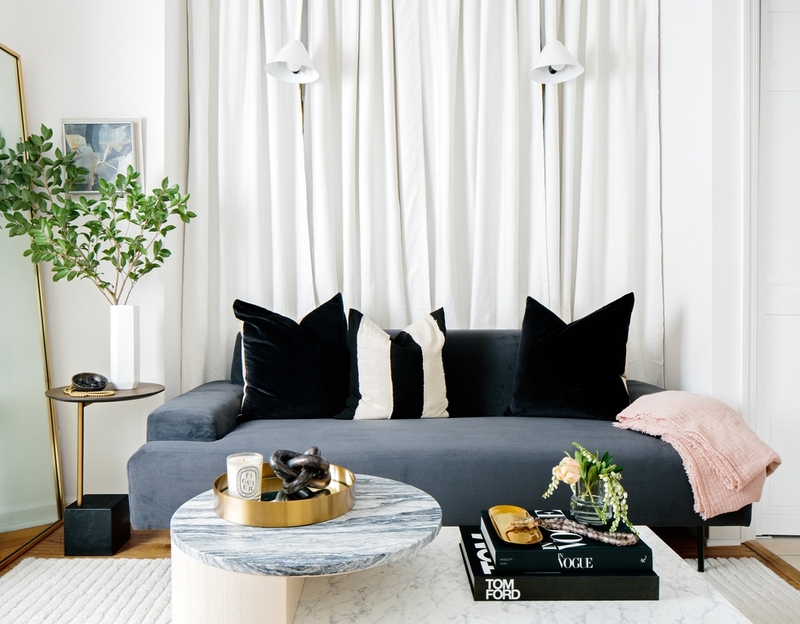 When MyDomaine’s senior editor Sophie Miura and her boyfriend Andy moved from Australia to a small Manhattan apartment they quickly learned what "cozy" really meant in New York City terms. With a 350-square-foot one-bedroom apartment on a quaint tree-lined street in the East Village, they were eager to make their new apartment feel like home. Sophie reached out to Decorist to help design her living room and maximizing the (tiny) space. Enter TLC star and Decorist Celebrity Designer Jeremiah Brent who Sophie chose to give her space an ultra-stylish Decorist makeover. Jeremiah got to work on Sophie’s small living room and the results are chock-full of small space tricks, personal décor items, sophisticated design details and inviting vibes that prove size really doesn’t matter. Read on to see the stunning transformation! Sitting tightly between the bedroom and kitchen, the small living area had just enough space for a few key items. Luckily, Jeremiah was well-versed in small-space challenges and took the design to the next level with beautiful results. Jeremiah brought Sophie’s elevated and relaxed fashion sense into the space to create a modern living room anyone would love. To create twice the visual space, Jeremiah used two full-length mirrors with a minimalist design and brass frames and leaned them on either side of the french doors leading into the bedroom. The mirrors help to maximize the size of the living room creating an illusion of a larger space. Focusing on Sophie’s minimalist inspiration, the main color palette used to anchor the room were black, white and slate. Pops of color are trickled throughout the room—a blush throw blanket, the beautiful art from Consort, the natural green of plants, colored glass beads and lots of warm brass help to create a bright and inviting atmosphere. The skinny console with its black metal base and white marble top serves as another surface area for perching books, art and accessories. Sophie’s living room lighting is modern and funky with a mid-century twist. The unconventional shape and elevated brass make the overhead chandelier simply show-stopping. Anything that draws the eye upward plays up the vertical plane of the space—giving it the illusion that a room is bigger and taller than it actually is. Marble accents, such as this gorgeous coffee table, are abound in Sophie’s new living room adding an organic element of warmth and dimension to the space. 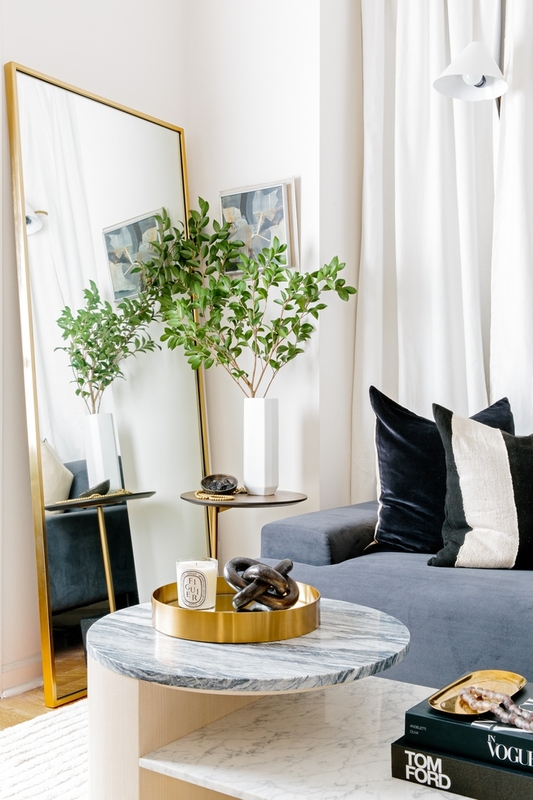 Jeremiah balanced the various shades of marble with understated brass, glam metallics and black accents adding a masculine edge to the room. Forget the gallery wall—try a drapery wall! Drapery is a cost-effective and dramatic way to add instant architecture to any room. It allows you to experiment with different textures and expands a smaller space while keeping it interesting. 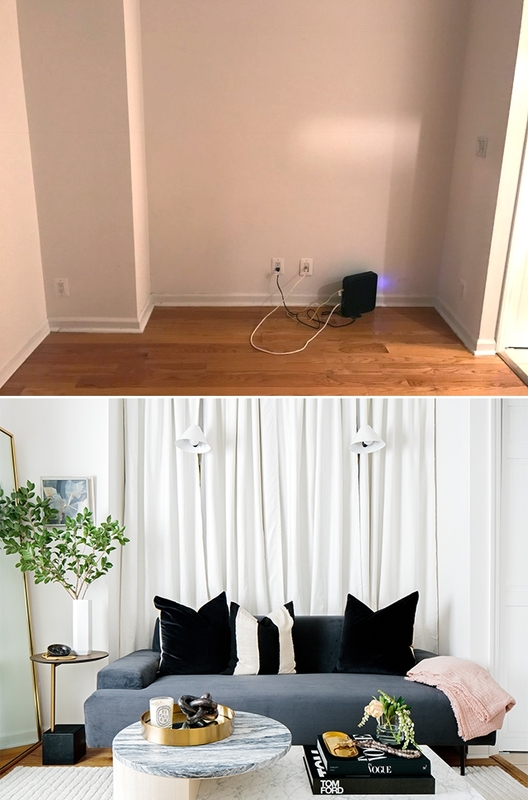 Jeremiah had sconces tucked into the drapery wall behind the sofa for an unexpected look saving space by freeing up both the side table and the floor—truly a unique way to keep things fresh and functional. Even though you may live in a small space that doesn't mean you can't entertain. 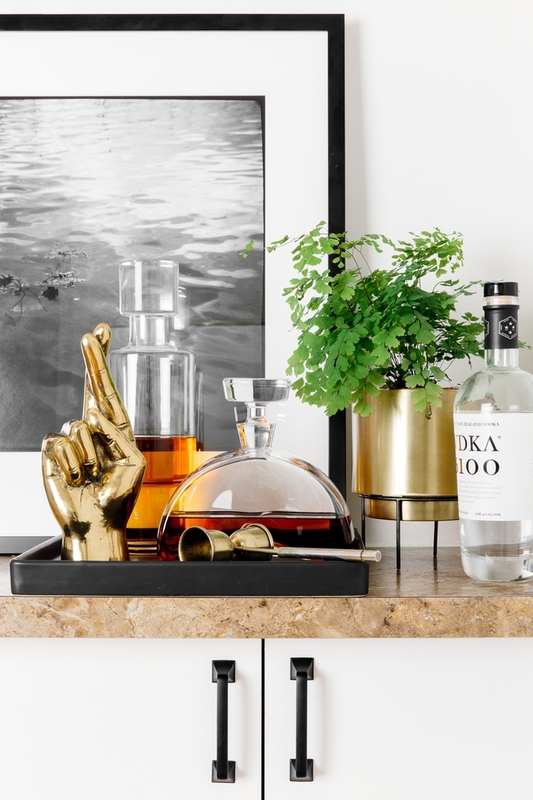 Setting up a stylish bar area creates a fun and chic focal point and is a great place to store—or showcase—your libations! When it comes to designing a small spaces or any space for that matter the accessories are paramount. There’s nothing that a little greenery can’t fix (or make feel incredibly cozy). Plants seamlessly blend with the room while amplifying the entire space. Statement pieces such as this accent chair serves both form and function and stuns with its curved lines and brass legs. Want to give your living room a stylish makeover? Get started on your own design project and work with a talented Decorist Celebrity Designer like Jeremiah Brent. Decorist Celebrity Designers are in high demand (for obvious reasons!) so be sure to book a project before it’s too late. Happy Decorating!